NEW ORLEANS, Louisiana, June 3, 2010 (ENS) – BP has tonight placed a containment cap over the damaged Deepwater Horizon wellhead that has been gushing oil and gas into the Gulf of Mexico for the past 45 days, but oil is still coming out of the well. Working for hours with remotely operated subs at a depth of 5,000 feet, technicians placed the steel cap over the leak at 8:35 pm. BP officials declined comment about the operation’s success or failure until the National Incident Commander, U.S. Coast Guard Admiral Thad Allen, holds a news briefing early Friday. “It will be some time before we can confirm that this method will work, and to what extent it will mitigate the release of oil into the environment,” Allen said. The 14-foot by 4-foot containment cap, technically called the Lower Marine Riser Package containment system, is not fitting as closely as planned because a remote operated hydraulic shear had to be used to cut the damaged riser pipe instead of a diamond wire saw that became jammed during an attempted cut on Wednesday. The diamond saw blade had trouble cutting through the drill pipe inside of the riser pipe, Allen told reporters this morning. Because the cap is so loose, BP engineers are concerned that cold sea water mixed with oil and gas could form icy gas hydrates, blocking the flow of oil up the pipe to a drillship on the surface. The cap has several holes through which methanol and warm water will be pumped to fight the hydrates by warming the mixture, BP technicians have explained. Dispersants are being released at the wellhead to break up the oil that is still flowing. The dispersants will continue to be used until oil is no longer emerging from the site, Allen said. That could be around August 2, when the first of two relief wells now being drilled can intercept the damaged well and shut it down. 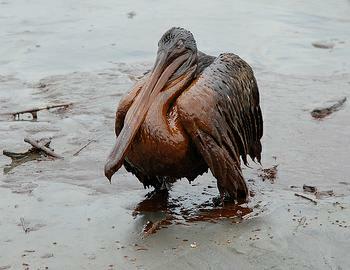 BP has struggled through a number of failed attempts at containing or stopping the oil spill. 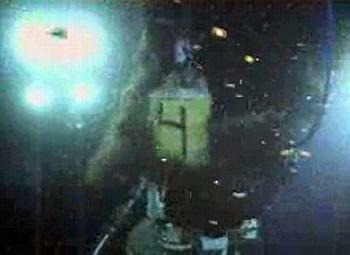 First, a much larger containment dome plugged up with hydrates, became buoyant and had to be abandoned on the seafloor. Then, as smaller dome, called a “top hat” was lowered to the seafloor but not used. Insertion of a tube into the damaged pipe collected some oil and carried it to a ship on the surface, but only about 20 percent of the gushing oil was captured in the insertion tube system. Last Saturday, an attempt to “top kill” the spill by pumping heavy drilling mud down to plug the wellhead failed. Meanwhile, the oil spill continues to spread, damaging shorelines in Louisiana, Alabama and Mississippi and showing up as a sheen in the Florida Keys. Today, driven by strong winds and weather, the spilled oil impacted a brown pelican rookery on one of Louisiana’s eroding barrier islands. Sixty birds, including 41 pelicans, on the Queen Bess Island Pelican Rookery were found coated with oil. These birds are being rescued and transported to the Fort Jackson Rehabilitation Center by wildlife responders, veterinarians, biologists and wildlife rehabilitators. The U.S. Fish and Wildlife Service, Louisiana Department of Wildlife and Fisheries and a team of other wildlife responders will assess the situation and will work to restore the rookery and its natural habitat. The National Oceanic and Atmospheric Administration, NOAA, said tonight that onshore winds are expected to continue moving oil toward shorelines in Alabama, Mississippi and as far east as Freeport, Florida. Threat to shorelines in Breton Sounds, Chandeleur Sound, and the northeast side of the Mississippi Delta continue to decrease, while threats to shorelines west of the Delta between Timbaleir Bay and Southwest Pass increase. Offshore, satellite imagery analysis continues to show narrow bands of oil to the southeast and east-southeast of the main slick. An overflight to the region on June 2, observed one narrow semi-contiguous band of colorless sheen stretching approximately 60 miles. It is likely that the Deepwater Horizon oil will enter the Loop Current and be pulled around the Florida peninsula and north up the U.S. Atlantic coast as early as this summer, according to a detailed computer modeling study released today by the National Center for Atmospheric Research.